Lately, I’ve noticed there’s a lot of grumbling online about the Inhumans, the traditionally second-tier characters with mutant-like powers that Marvel’s been pushing quite hard lately. This push has come both in comics (an explosion of titles, crossovers, etc., including this month’s solicitations) and in other media (they’re on “Agents of SHIELD”). First appearing in “Fantastic Four” #45 in 1968, the Inhumans are a race of humans that gain powers when exposed to the mutagenic gas the “Terrigan Mists,” which give each person a different power, similar to X-Men’s mutants. The main characters are a group called the “Royal Family.” They’re a family that’s traditionally ruled over/led the until-now smallish group of Inhumans. However, recent storylines have seen the Terrigan Mists spread over the Earth, leading to a mass explosion of people with Inhuman heritage to gain mutant-like powers. The most prominent such person so far is Ms. Marvel. 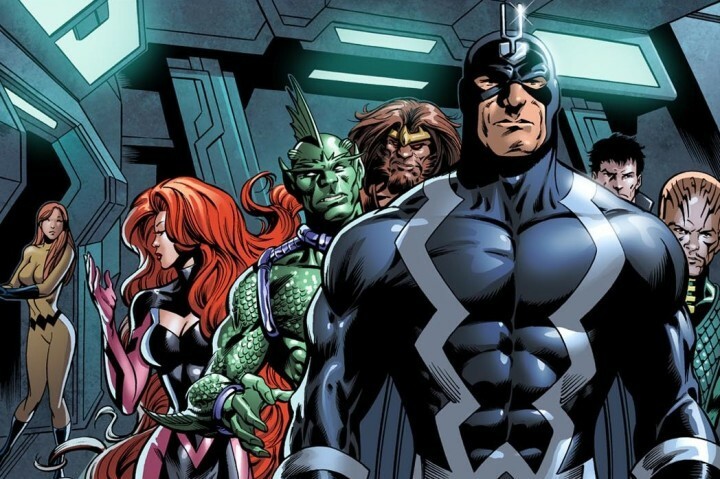 The reasons for the Inhumans push are rather corporate: movie rights. Marvel sold the film rights to Fox for not just the X-Men, but the concept of “mutants” itself. Someone at Marvel has presumably remembered they have the Inhumans, whose powers are mutant-like (despite having a completely different backstory). Also important, their media rights are still under Marvel’s ownership. Somewhat aggressive. They’ve got their own book, various appearances in other books, etc. The Inhumans are a concept that was fairly B-list until recently. Being done in part for non-comic-related, commercial reasons, versus comics/story related reasons. Still, the characters do have fans, though maybe they aren’t as vocal as the non-fans/those who’re indifferent. Also, the upcoming “Inhumans” TV show, due in 2017, might improve their image the way “Guardians of the Galaxy” did for Rocket Raccoon and Star-Lord. As Marvel’s films have shown, even a B-list concept can be elevated to stardom with good writing. A decade ago, even Iron Man was a second-tier character versus, well, the heavy mutant/X-Men presence or Spider-Man. Now, everyone knows who Iron Man is, and even recent merchandise like my Lego Marvel game shows Iron Man front and center, not main Marvel star Spider-Man. How do you feel about Marvel’s Inhumans push, or the Inhumans themselves? Will they ever “be a thing?” Chime in below in the comments. I don’t mind the Inhumans push. But I don’t like the plans to use the Terrigan Mists as a tool that sickens/kills mutants and the apparent plans to remove most of Marvel’s mutants from Earth. You mentioned Squirrel Girl. But then there are mutant Alpha Flight members and other mutant characters not currently involved with X-Men such as Sunspot or Cannonball or even (supposedly) Devil Dinosaur. How can these mutants remain as active Avengers or whatever while we’re supposed to believe that Earth is now toxic to Marvel’s mutants? Seems Marvel really wants to push Inhumans/cut down on the amount of mutants, which I imagine will just annoy some fans even more.